At the 2011 Pebble Beach Concours d'Elegance, spectators were treated to seeing the only surviving Adams-Farwell automobile. 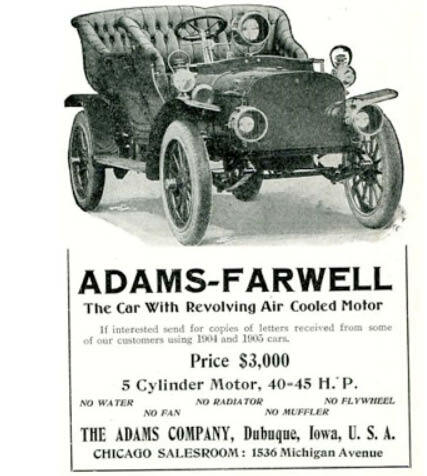 Between 1898 and 1907, the Adams Company manufactured fifty-two automobiles featuring futuristic innovations including fuel injection, supercharging, and automatic timing. There was even a model capable of 75 miles-per-hour, if a road, such as the Long Island Motor Parkway, could be found that could handle such speeds. 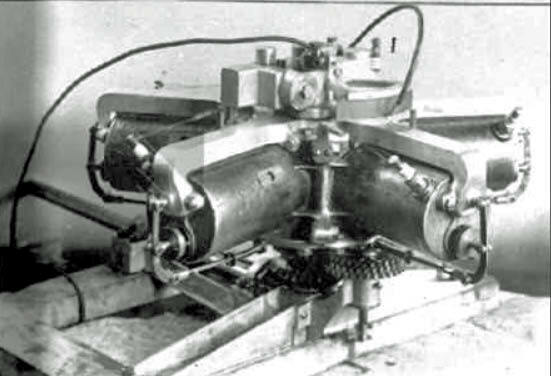 The car was the first in the world to be powered with an air-cooled rotary engine placed in the rear of the car ahead of the axle on a vertical axis. As seen in this 6- minute video, the 1906 Adams-Farwell won the prestigious Charles A. Chayne Trophy at the 2011 Pebble Beach Concours d’Elegance. This trophy is awarded to the car with the most advanced engineering of its era. The automobile is part of the Harrah Collection at the National Automobile Museum. The same Adams Farwell 5 cyl. rotary engine car was once at the Long Island Automotive Museum and owned by H. Austin Clark Jr. I don’t think he ever ran it but it was on display in the room with the show cases.